Whether it is a bankruptcy restructuring or liquidation, these unfortunate outcomes are the last thing any financial counterparty wants to deal with. The FRISK® score, calculated by a proprietary model that evaluates business financial health, can help you avoid these challenges by harnessing the crowdsourced research activity of credit professionals. This crowdsourced activity is modeled through what is known as the Activity Score, a proprietary component of the FRISK® score model. A few publicly traded companies that had their FRISK® scores negatively impacted by the Activity Score before their eventual bankruptcy filings were Catalyst Paper Corp., Cosi Inc., and Performance Sports Group. The Activity Score collects and analyzes the data patterns of the CreditRiskMonitor subscriber base. Subscribers include financial professionals from more than 35% of the Fortune 1000, in addition to many other large corporations. By integrating the Activity Score, along with market sentiment, credit agency ratings, and financial information, the FRISK® score now has a 96% accuracy rating for predicting financial distress over a 12-month timeframe pertaining to US publicly listed companies. The Activity Score model is so powerful because it considers the research activity from thousands of risk professionals, which include credit managers, procurements managers, and other financial professionals. Under SEC fair disclosure rules, publicly traded companies must be very selective about what information they release to the public. On the other hand, many risk managers have this information directly at their fingertips from sources within their own company, such as sales, and from outside sources at other companies. These individuals are unique in that many belong to Fortune 500 companies. They are the gatekeepers and have significant influence on the amount of trade their company does with the subject business. The crowdsourcing Activity Score aggregates their relevant research activity on CreditRiskMonitor’s service. CreditRiskMonitor has tracked this research activity for nearly 10 years and found that certain patterns of activity on our website indicate heightened risk. Principally, it is the unique hierarchical structure of our website and the way our customers use the service that helps identify when a specific company might be slipping toward financial distress, and on occasion, even bankruptcy. Another way of putting it is that the Activity Score recognizes concern, and in aggregate, it signals trouble that might be developing at a given company. It isn’t surprising that procurement professionals (“buyers”) could have significant influence on their customers. However, credit professionals do too. Given that trade payables serve as the third largest source of external financing for corporations, this group of risk professionals also has clout. When you step back and look at it through that lens, it’s easy to see how much of an influence financial trade receivable stakeholders may have on their customer’s future. For example, these counterparties can impact anything from inventory financial carry costs to operational flexibility. In extreme situations, if a company appears more and more financially stressed, just a few counterparties cutting ties can alter the company's very ability to survive. Keep in mind that the research activity patterns (which web pages they visit) from multiple subscribers on the service, not their frequency of use, drive the Activity Scores’ output. Therefore, the Activity Score component is able to distinguish between routine reviews and deep dives that highlight legitimate concern about a particular company. In essence, risk managers are effectively communicating anonymously through the Activity Score, allowing the FRISK® model to identify credit risk faster and with more precision, because it is computed every day. In most cases the information from the Activity Score is already contained in other data components of the FRISK® score (for example, stock market action, financials, and bond rating agency ratings), and so this new data will not change the value of the FRISK® score. However, in some cases where the website activity of a subject company indicates a higher risk than represented by the other factors, the Activity Score information will reduce the value of the overall FRISK® score. The biggest impact is in the lower FRISK® buckets, since these represent higher risk and larger changes in risk between consecutive risk buckets. But significantly, the Activity Score component can move a business whose score is in the “blue zone” into the “red zone” high-risk area. Being in the FRISK® “red zone” implies this is a business with a higher than normal risk of bankruptcy; it is the first red flag a user receives that this is a business worth tracking and that they should consider planning for future financial problems. Although there are numerous examples of FRISK® scores being impacted by the crowdsourced component, the most important ones are where the impact was felt well before bankruptcy was declared. As we all know, identifying and monitoring trouble with enough lead time is absolutely vital. In fact, just a few extra months can be the difference between safety and disaster in terms of dollar exposure. Catalyst Paper Corp. is a great example. This specialty paper printing company experienced a fairly rapid deterioration that might have caught some financial stakeholders off guard. CreditRiskMonitor subscribers, however, would have seen the company’s FRISK® score decline from “4” to “2” through the middle of 2016. Generally, if a company is trending within the FRISK® “red zone” (a FRISK® score under “6”), counterparties should be closely monitoring their financial exposure. Part of the weakness shown in the FRISK® was driven by the Activity Score, which began taking effect in early June. In this case, the company’s high risk profile was displayed several months before the bankruptcy filing on November 1, 2016. Cosi Inc., which hails from the casual dining segment of the restaurant industry, fell victim to challenges of declining traffic and higher operating costs. Over the course of 2015, the company’s FRISK® score fell from a “6” to a “3,” putting it squarely in the “red zone,” which indicated a substantial increase in risk. Given a confluence of factors, the company’s FRISK® then declined to a “2” by May 2016. The Activity Score then pushed the FRISK® score down further to the worst possible “1” by early July, which translates to a 10–50% probability of bankruptcy over the following twelve months. Overall, subscribers would have seen the increasing distress levels throughout 2015, and then acute danger before the company filed for bankruptcy on September 28, 2016. That wasn’t the case. The FRISK® score picked up on hidden trouble in the second half of 2015 as the score shifted from “6” to “4.” The FRISK® indicated even further weakness by January 2016, as it shifted down to an unsettling score of “3,” and then “2” in the following month, despite the “Z” score remaining within a tolerable range. By April, the Activity Score also began indicating elevated risk and pushed the score to the most distressed level of “1.” All told, even though some analysts thought management would be able to safely delever the balance sheet, the FRISK® score signaled high distress about 10 months before the bankruptcy filing on October 31, 2016. As shown above, the Activity Score component increases accuracy and timeliness, making the FRISK® score best in class. This component results from crowdsourcing the research activities of a critical group of risk professionals whose companies extend working capital or may be large customers. In the examples above, the FRISK® score identified financial distress well before each of these three companies filed bankruptcy. Score changes provided a reasonable window for credit professionals to reduce the size of, or completely eliminate, their financial exposure. In the same vein, procurement professionals can use this tool to recognize financially unstable suppliers to help mitigate expensive supply chain risks. Sometimes, risk managers are falsely guided to gloss over large public company risk, and yet it can be one of the biggest headaches risk managers have to deal with. Catalyst Paper Corp. and Performance Sports Group both had nearly $1 billion in total assets, and yet they fell apart in what seemed like a blink of an eye. What's most telling from these examples, however, is that the research patterns of CreditRiskMonitor customers clearly impacted their FRISK® scores, indicating severe risk, particularly at the most important time. 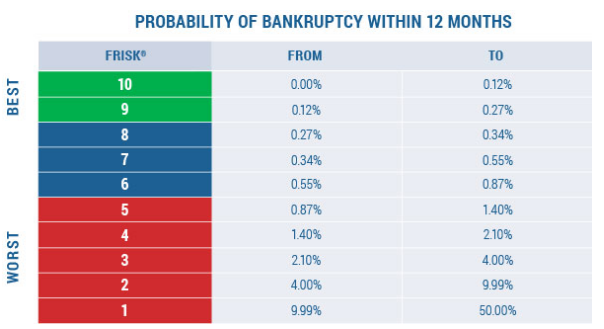 For further information about bankruptcy warning signs, check out our Bankruptcy Case Studies to learn about catching substantial portfolio risks before they hit your own company. The FRISK® Stress Index is a model that provides the average probability of failure for a group of companies (e.g., by industry, portfolio, or country) over the next 12 months. The level of risk is measured through a scale of 0 to 50, with 50 being the most risky.